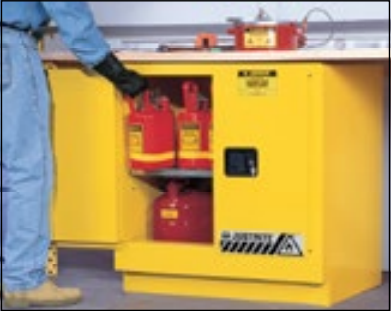 Take advantage of under counter space to safely store flammable liquids. Each cabinet is sized and fitted with a 3-1/2-in H x 2-1/2-in D (89-mm x 64-mm) toe kick to mount flush with other cabinets. Dual vents with flash arresters on the back wall provide for an easy connection if ventilation is needed. Self-levelling feet adjust to 1-1/8-in (29-mm) for alignment on uneven floors.